Kateys Diary: Election fever grips us. This morning I heard on the Nolan Show that they are to record an election special on Wednesday, no doubt to co-incide with UTV's election debate live. I haven't seen audience places advertised as they do on the BBC but who ever is there it ought to be a lively debate. Twitter can certainly buzz with comments from various political commentators giving their views and I have seen plenty of party people out on the stump. Including ones that needed their shoe laces tied! 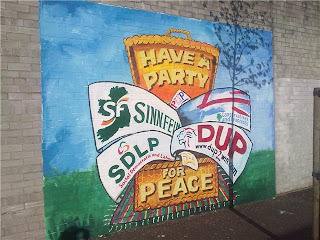 There is also a neat little mural on the Falls Road with a play on the word 'party'. At least its different. There are of course the usual placards on the usual poles with all the usual faces on them, but Alliance have done a rather neat job of putting out various types of political poster. 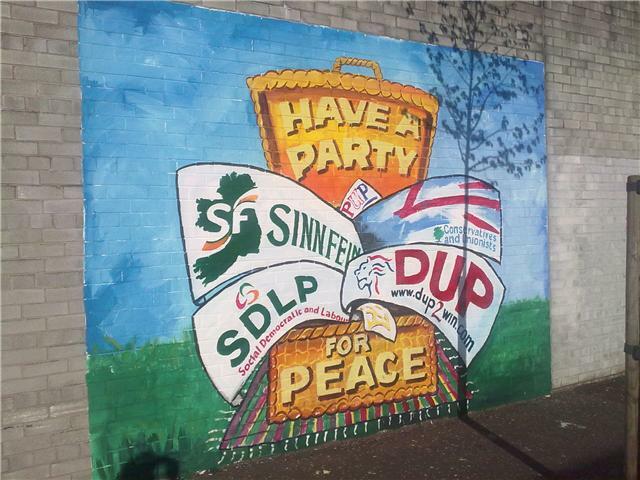 Driving through South and East Belfast is a voters dream, with Alliance and various shades of unionsim all on offer. Here in the nationalist west we have had blanket coverage of Adams which I was begining to think was a take it or leave it situation for voters but within the last few days the SDLP are poking their nose above the parapet and putting up some posters and I have seen them out on the stump, so maybe variety is looking up. 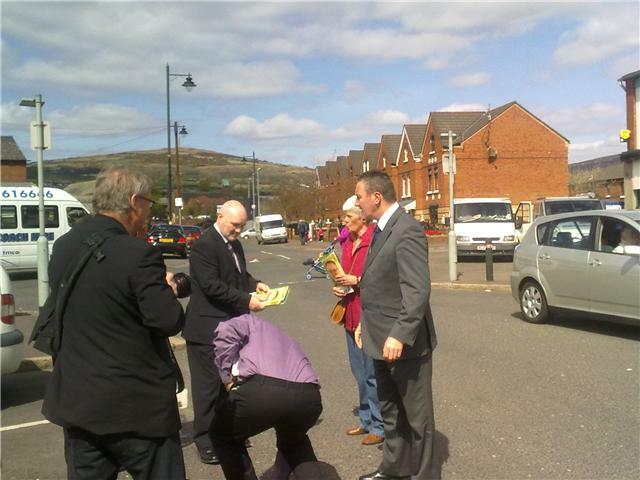 Conservatives too, have been out and about in the west with some comments on twitter telling me they were in Lenadoon!!! And were treated favourably!! Maybe we are moving on. created by Kateyo at approximately 4:22 AM Categories Belfast. Election.